Fairfax County police apprehended two boys during a pursuit on Baron Cameron Avenue and Cameron Health Drive just before midnight on Sunday (March 18). Police believe the driver ran a traffic light at around 11:40 p.m. A pursuit followed when the officer tried to stop the vehicle. Officers then chased and caught the two boys as they exited the car and ran away. Petitions for felony speed to elude, unauthorized use, disregarding a traffic signal, and no license will be sought, police said. 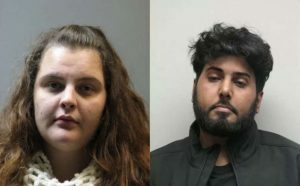 In a separate incident, 25-year-old Reston man was arrested and charged with drinking in public on Friday at around 8:37 p.m. Police said Raheel Aijaz and Amber Hartzell, 23, of Springfield, were sitting in a car in a parking lot. Police officers approached the car after receiving a report of a suspected drunk driver. The driver, Hartzell, drove off, forcing police to pursue the car. She was charged for driving while intoxicated. As we reported earlier this week, a 61-year-old Reston man arrested for shooting his dog and dumping the body near a Fairfax County park. 2300 block of Hunters Woods Plaza, food from business.